Abstract: This paper describes the conservation treatment at the Monastery of St Catherine, Sinai of an illuminated manuscript preserved in an important but severely damaged sixteenth-century Greek-style Sinai binding. The conservation treatment aimed to restore functionality to this binding with minimum intervention enabling the important manuscript to travel to an exhibition. The repair techniques evolved during treatment as the two conservators studied and used the techniques of the original binder. The repair included the partial in situ re-sewing of the manuscript, working around and supplementing the original sewing, and reattaching the wooden bookboards. The primary endbands were repaired to preserve and support the unique secondary metal-thread endbands and a new method was devised to repair an interlaced clasp-strap. The planning, as well as the working methods and techniques described, highlight new avenues both for the conservation of Byzantine manuscripts and for future conservation at this important library. 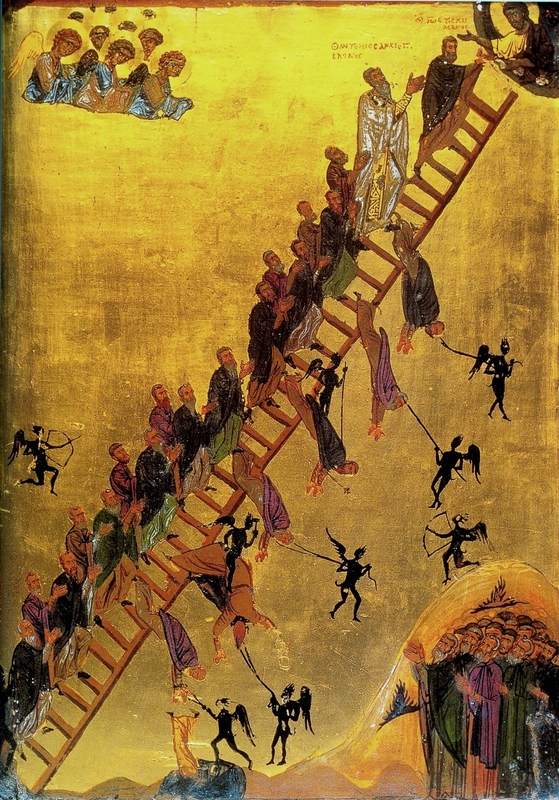 Introduction: The Heavenly Ladder, written in the seventh century ad by John Climacus, is a treatise on monastic virtues consisting of thirty chapters conceived as rungs of a ladder reaching from earth to heaven. The work was designed for the monks of Raitho, the present day El-Tur on the Red Sea coast of the Sinai peninsula, but found a much wider audience in Greek monastic communities and became “the most widely read of all ascetic writing”. John Climacus (before ad 579–c. 650) was a Sinai hermit before becoming abbot of the Monastery of St Catherine, Sinai and the Monastery, where the work was written, preserves in its library one of the most richly illustrated manuscripts of the Heavenly Ladder. MS. Greek 418, a twelfth-century ad illuminated parchment manuscript of 313 leaves, has 43 miniatures illustrating the prefatory material and the 30 chapters or homilies on spiritual exercises for the monks. For detailed information of the manuscript with illustrations of all the illuminations and earlier bibliographies see Martin, and Weitzmann and Galavaris, for the Monastery and its library see Nelson and Collins, and Manafis. Although the provenance of the manuscript is not known, Martin (and his view repeated by later writers), thought that the manuscript was produced in “a region near Palestine, perhaps actually at Sinai”. The sumptuous manuscript is preserved in an equally lavish and rare blind-tooled, Greek-style binding; it is covered with a fine-quality red tanned-goatskin, has silver furniture and elaborate secondary endbands of silver and silver-gilt metal threads, Fig. 1. Weitzman and Galavaris dated the binding to “the second half of the fourteenth century” and Boudalis to the fifteenth century “possibly in Constantinople”, but recent work by Sarris has now firmly placed this binding in a group of nine manuscripts bound at the Monastery in the late sixteenth century ad. The quality of the binding of this manuscript is unsurpassed by any other bound at the Monastery and is of great importance. The binding has an unsupported sewing structure, using four stations, with wooden boards attached to the sewn bookblock by means of sewing thread only; a textile spine lining extending onto the outer face of the boards; endbands sewn to the bookblock and the head and tail edges of the boards; and metal bosses and triple interlaced leather clasp-straps laced through the right board with metal rings that fit over edge pins on the left board. For an overview of Greek-style bookbinding with bibliographies of the earlier literature see Federici and Houlis and Szirmai, for the unique all metal-thread endbands see Boudalis, and for a glossary of bookbinding terms see Ligatus.